The rezoning proposals for Seymour Landing and Parkview Slopes are bringing forward ideas that were proposed years, even decades, ago. The initial proposal for the Cates Hill rezoning in 1996 included the creation of a small neighbourhood/community college at Parkview Slopes surrounded by a live/work community composed of artists and artisans. The planning concept of a resort community at Seymour Landing was raised in the 1980s and again in the 1990s. For various reasons, those visions never came to fruition. The zoning for Parkview Slopes was part of the comprehensive zoning for Cates Hill which was approved in June 1999, and which was the outcome of an extensive public consultation and planning process following the implementation of Official Community Plan Bylaw No. 139, 1995. At that time we had proposed that the area now known as Parkview Slopes could include the creation of a small neighbourhood/community college surrounded by a live/work community composed of artists and artisans. The then new Island Pacific School was intended to become the nucleus and first phase of a “micro college.” What has since become the neighbourhood park and the land surrounding the Tir-na-nOg Theatre School was intended to be accessible to Island Pacific School and other users of the micro college for outdoor recreation and sports. To the north of that area, above what is now known as Artisan Square, the intent was to provide boarding facilities for Island Pacific School and temporary students of the micro college. The micro college was intended to teach and train crafts and artisan skills which had developed and evolved over the last 300 to 400 years and which, since the age of industrialization has taken over, are now increasingly at threat of being irretrievably lost (such as movable type printing, glass blowing, leaded glass compositions, string instruments, small wooden boats, bookbinding, classic furniture building, restoration of art works and museum exhibits, etc). What has since become the Rivendell Retreat was intended to be the centre for the teaching of artistic and spiritual underpinnings for the artisan trades and crafts. What has since become the Artisan Square was intended to provide part of the live/work community with the aim of establishing a fully functional arts and crafts community on Bowen Island. 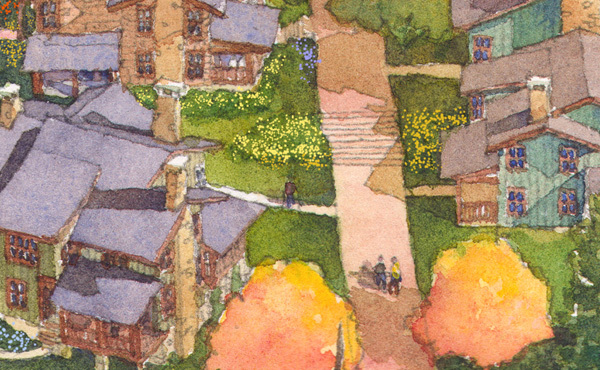 While that vision was not adopted in the zoning, our proposal was at least partly successful on two fronts: 1) approval of a retreat on the site which now accommodates Rivendell Retreat, and 2) approval of sites for Island Pacific School and Cates Hill Chapel (however, they were located at Carter Road instead of Parkview Slopes). The bulk of the remaining lands on Parkview Slopes received zoning for 24 residential lots with a minimum size of 900 square metres. Subsequently “vehicle repair garage” use was added to this area to allow Leigh Automotive Repair to operate within Parkview Slopes. We submitted a rezoning application to the Municipality for the Parkview Slopes and Seymour Landing areas. Advertisement entitled “Sustainability and the Future of Bowen Island” (2 pages) in the Bowen Island Undercurrent on October 9, 2009 and in the Bowen Island Times Editions on October 16, 2009. Advertisement entitled “Density Transfer — what it means and how it could help toward the goal of sustainability” in the Bowen Island Undercurrent on October 16, 2009. We hosted a public information meeting about the rezoning proposal for Parkview Slopes and Seymour Landing. A summary of the proposal was made available to people who attended the meeting. We met or corresponded with Municipal planning staff several times. An update of Bowen Island’s Official Community Plan (OCP) was soon underway, and our application was put on hold pending the outcome of that OCP update. It’s worth noting that a number of ideas we had put forward found their way into wording in the OCP. We submitted a rezoning application to the Municipality for Seymour Landing at Cowan Point. We met with Municipal staff regarding the rezoning proposal for Seymour Landing. Subsequent to that meeting, we decided to amend and simplify the proposal. We submitted an amendment to the rezoning application for Seymour Landing, and reactivated the rezoning application for Parkview Slopes. The applications included a report about Seymour Landing dated September 9, 2014, and a report about Parkview Slopes dated September 9, 2014. We made a presentation to Municipal Council regarding our rezoning applications. We published an advertisement in the Bowen Island Undercurrent — an invitation to public information meetings scheduled for September 20 and 25, 2014, and a summary of the rezoning proposals. We published a mailout that was delivered to all mailboxes on Bowen Island — an invitation to public information meetings scheduled for September 20 and 25, 2014, and a more detailed summary of the rezoning proposals. We published a 2-page advertisement in the Bowen Island Undercurrent — an invitation to public information meetings scheduled for September 20 and 25, 2014, and a more detailed summary of the rezoning proposals. We hosted two public information meetings about the rezoning proposals. Approximately a total of 100 people attended the meetings. A slideshow was shown as people gathered for the meetings. A summary of the rezoning proposals for Parkview Slopes and Seymour Landing was made available to people who attended the meeting. We published an advertisement in the Bowen Island Undercurrent — a thank you to those who attended the public information meetings, a summary of questions asked, and a brief description of what will happen next. We met several times with Municipal staff regarding the rezoning proposals. The rezoning proposals for Seymour Landing and Parkview Slopes are bringing forward ideas that were proposed years, even decades, ago.